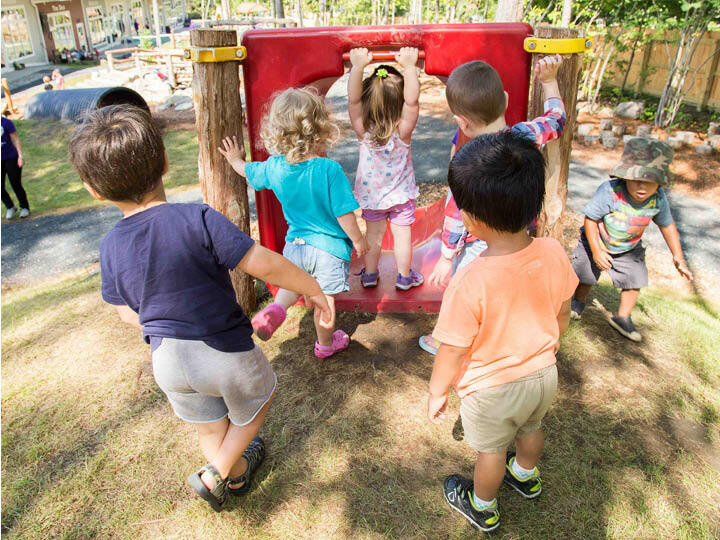 All learning styles, ages, and developmental areas have been considered in the design and creation of our unique playground to support all children. Author Richard Louv termed the concept of “Nature Deficit Disorder” in his book Last Child in the Woods. FitKids Childcare has a desire to help children become comfortable and engaged in our natural environment and has created a playground that encourages children to interact with our outdoor surroundings. FitKids Childcare is able to offer our families access to the heated, indoor recreation pool at River Valley Club for no additional cost. FitKids Childcare families are invited to share the pool with Club members at dedicated times Monday-Sunday. FitKids Childcare has the privilege of offering structured physical education classes by a retired teacher and RVC member, Frank Leahy. Frank generally works with our Pre-K and older preschool children to provide them with movement opportunities that challenge their physical development. During the academic school calendar, FitKids is lucky to have a very talented music teacher visit each week to provide music curriculum for our children. Children are actively engaged during their 20-30 minute sessions and often go home singing new songs for parents to learn. We have partnered with River Valley Club to offer swim lessons for children as young as three years, plus special program options for younger ages.